This video gives you all you need to survive in the world of bass guitar. 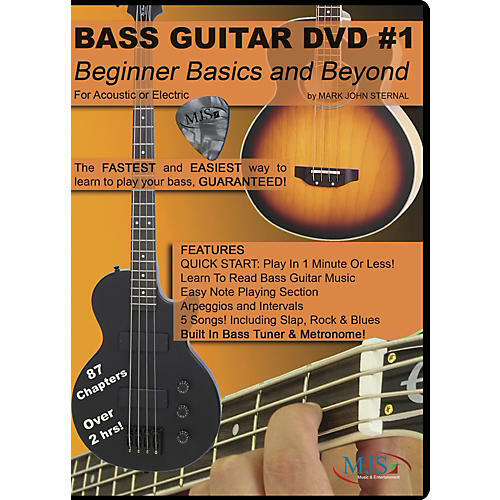 Bass Guitar DVD #1: Beginner Basics and Beyond from JMS Music Publications is one of the fastest and easiest ways to learn to play bass. Use the DVD to learn to read bass guitar music with notation, tab, and charts. Start playing instantly. Learn individual notes one string at a time, then progressively build up to playing on all strings using scales, rhythms, arpeggios and intervals. Graduate to your first 5 songs in the most popular music styles including slap bass, rock, and blues.